Celebrated comedian Jimmy Fallon is back on The Tonight Show after spending almost two weeks in an intensive care unit, following a rather nasty finger injury that almost resulted in amputation. 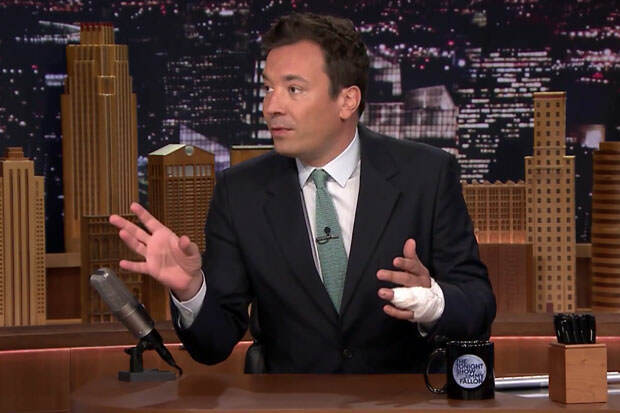 Fallon opened up about his dreadful experience on his show, explaining that his wedding ring got caught on a countertop when he fell in the kitchen. Due to the nature of the injury, poor Jimmy was rushed to New York’s Beth Israel Deaconess Medical Center immediately, where doctors told him the odds were not in his favor. Though he was prepared for the idea of losing his finger, he must have been over the moon when he was told the finger would be saved. As far as the ring is concerned, it was also damaged in the accident and is currently being repaired. However, Jimmy assured everyone in the audience he would never wear it on his finger again and added that he couldn’t wait to burn his wife’s beloved rug, the main culprit behind the incident.